The convection loop started in reverse again this morning, so I re-plumbed the water side of the system with the hot side going in to the upper element port rather than through the lower element port and the chimney pipe. That didn’t work either. Since I was using shark-bite fittings on the solar loop, I switched the solar hot and cold lines just so see if that would make difference. Nope. I switched them back, cooled down the whole system by refilling it with cool water, and it immediately started pumping in the correct direction and the solar side stayed much cooler than yesterday when the convection loop was flowing in reverse. We installed 6 sensors on the tank and 4 on the solar loop plumbing around the tank. Tomorrow well install some thermocouples on header and maybe down into some of the evacuated tubes. It seems that this project is not going to be trivial. We set the 30-tube collector up and started to take temperature readings. It is definitely heating the tank. The thermometer inserted into the shell and against the upper part of the tank shows that the temperature of the tank reached 140F, but the hot side of the heat exchanger never got above 120F. I started looking more closely and burned my ankle when it rubbed against the cold side of the hx. I put a thermometer on it and it showed 175F, just a little below the 180F solar loop. 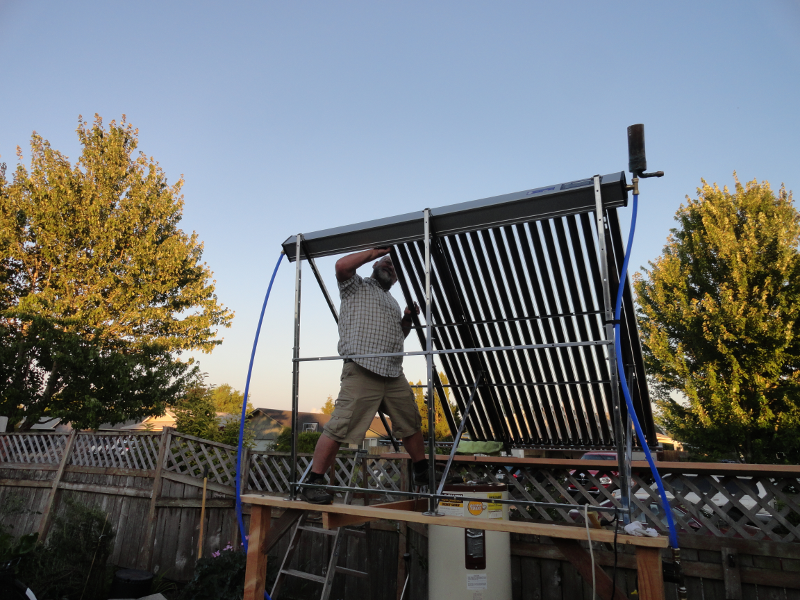 I was running the solar loop pump at about a gallon per minute at almost no delta-T. I thought that the low delta might be the problem, so I slowed the pump with an in-line valve. When I slowed the pump to about 1/2gpm the header started to boil and steam. That means that a pump rate below 1/2gpm may not be fast enough to transfer heat from the system. So, the geyser pump will have to be faster than that. We don’t have a good measure for how fast a double cricket flows. I will need to look back at the excel program Eldon and Dale wrote to size dragon systems. The current system does have a flow meter on the solar loop. We haven’t calibrated it, but it seems to be working well. I am gong to buy some hall-effect flow sensors to see if we can use them for determining flow rates in sealed systems. While insulating the solar loop and substituting copper for pex pipe at the head I dropped the pump/flow-meter segment and broke the fittings out of the pump. I ordered a replacement Friday night from Amazon and it arrived by 10AM Sunday! It’s running (in reverse), but it’s heating the tank. I’m going to pull out the chimney tube and seal it better. I noticed that it was loose in the brass fitting when I inserted it. To get some baseline data on the 30-tube array and the heat-exchanger we installed the collector rack above a fence in my front yard with a 50 gallon tank and a SolarPad heat exchanger. The large can on the end of the header is an expansion tank open to the air. This would be untenable in a normal system, but it will allow the water in the system to expand without breaking anything. Because we installed it directly above the electric pump, and because it was on the low side of the header (that started out to be level) we had to move it to the other end. We had the system up and running by noon and decided to go get some lunch. When we returned the the system had stagnated and did not seem to be pumping. We decided to install an old flow meter in line with the pump to see for certain. We did the plumbing in a hurry without covering the collectors with a tarp. We refilled the system and started up the pump. It worked for a few minutes, then ground to a halt, but the motor still seemed to be turning with no flow. We swapped out the pump, and the system ran for the rest of the day. We also installed a ball valve above the pump so that we can now control the flow rate. Next on the list: install the Raspberry Pi with 20 sensors and a pump relay. We’re going to build a simple pyranometer so that we have the ability to compare runs from one day to the next. We tested the Pi last summer and developed a very reliable python data logging program. We are still wrestling with the geyser pumper design for this much larger system.